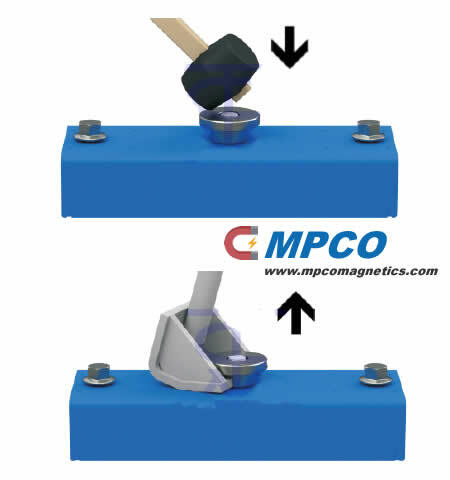 Magnetic boxes are used for manufacturing of concrete products. The company has developed a product line with breakout force of 450 – 2400 kg. Magnetic boxes with breakout force of 2100 kg and 2400 kg are produced serially. We are not going to rest on our laurels of success. Our experts are continuously working on improving of products’ quality. What is a Magnet Box? The magnetic box is made of steel body, made of high quality sheet steel, inside of which there is a galvanized magnetic system, able to provide the required breakout force and shear. The offered products are resistant to vibration and are able to withstand temperatures up to 120 °C. As a result, there is no need for their regular replacement, which saves not only money, but time. Our resources allow us to manufacture systems of any parameters and any characteristics. We are able to produce magnetic boxes for any manufacturer in Europe, Asia and South America. Each article has two mounting bores with thread. Mounting bolts permit to attach the box to the elements of almost any snap. As a result, there is no need in unsafe welding operations, and the customer receives the product of desired configuration, without serious time costs. The box is brought to the working state by a mallet blow (rubber hammer) impact on the system’s button. It is also easily turned off. It’s enough to raise the button using a special separation device.